The Colorado River is a large river and best fished from a drift boat. We use McKenzie type boats and rafts that are very comfortable. It is a big water and worth an introduction with local expertise. 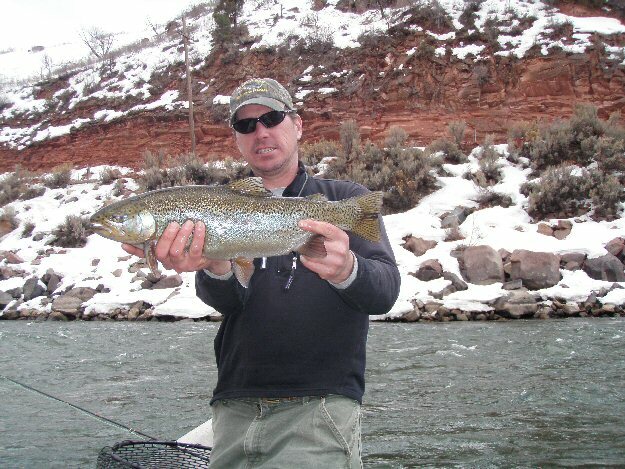 Although not as plentiful as the Fork or the Pan, the trout in the Colorado are big river fish. Since the completion of Wolford reservoir and the I-70 Glenwood canyon, the Colorado river is clearer and is more fishable year round. There are a variety of hatches from midges, drakes, bwos, yellow sallies, PMD's, stoneflies and caddis. Our float trips on the Colorado and Roaring Fork rivers have been very productive with some excellent fish. A variety of flies will work well. Dries such as hoppers with baetis and stone fly droppers. Streamers are also productive. We start fishing from the Grizzly put in all the way down to Rifle. In the heat of summer, the river improves below the confluence with the Roaring Fork if it is flowing well because of the colder water it adds. Down lower the Colorado opens out and the sun gets on to the water. The big secret about the Colorado is the quality of the fishing as a result of a serious stocking program undertaken by the DOW. They have introduced hofers and other big rainbows into the river which together with the very big browns which live there have made for an excellent fishery. Here is an example of a rainbow taken by Ed in March.